Inside: When Does a Toddler Master Spoon Skills. When to expect at toddler to be able to eat well from a spoon. Your baby is either at or approaching 12 months old and you find yourself wondering, “when do I relinquish the spoon?” This was something I thought about with my son. He always really liked baby food, and I was quite happy to continue feeding it to him well past 1 year of age because it meant I could easily calculate how much food was going into his body. Shortly after he turned a year old, he wanted that spoon to himself. He was really quite good at it, but I am admittedly a bit OCD and hated the mess it caused. I controlled myself and let him do a it. Then something odd happened. After a couple of months of working on it, he decided he was done and refused to use the spoon himself; Mommy or Daddy had to feed him. While I tried to remain rational about the situation, I also worried that he would never learn to use a spoon and I would be feeding him forever. Yes, I knew that wasn’t really going to happen, but you all know what I mean (at least I hope so 🙂 ). In reality, it was just one of those phases. Children want freedom and independence, but they often get a bit wishy-washy about it when they get it. This spoon strike didn’t last long; he soon was back to using it himself. The spoon strike is a common occurrence with toddlers. Things have been a bit different with Kaitlyn. She has never really loved mashed up baby food. She prefers it in the form everyone else eats it. Not only am I OCD, but slightly paranoid about choking. I tear and cut pieces of food up so that there is no way she could choke on it. Then I get around moms with babies the age of Kaitlyn (12 months), and just about die. Whole olives! What! LOL. I know I am paranoid. Kaitlyn eats mostly whatever we are all eating, with a few bites of baby food mixed in there. Right now, she has no interest in the spoon, and I am in no hurry to push it on her. When she wants it, I will let her practice. Other than that, all of her food is finger food that she feeds herself. For Brayden, self-feeding started around 12 months and slowly increased over time. While I don’t remember exactly, I would say I would have called him pretty independent around 14 or 15 months. For Kaitlyn, self-feeding started more around 9 months. After she turned 12 months old, she rarely ate baby food at all. Now, as she is approaching 13 months, I would say she is a pretty independent eater. I have no concern if she has a mean completely without baby food. She eats mostly fruits, vegetables, breads, and cheese. There are a couple of factors at play with the age differences. One is simply that Kaitlyn is a second child and I tend to be more aware of her capabilities than I was of Brayden’s as my first child. Another is the difference in there desires. Kaitlyn really insisted upon “real” food at a young age. She likely saw us eating real food more than Brayden did. When Brayden was a baby, I ate breakfast and lunch while he was asleep. He really only saw dinner happen. Kaitlyn, however, has sat at the table with Brayden and I for breakfast and lunch since 4 months old. A great thing about Kaitlyn’s self-feeding right now is that she eats all finger foods. 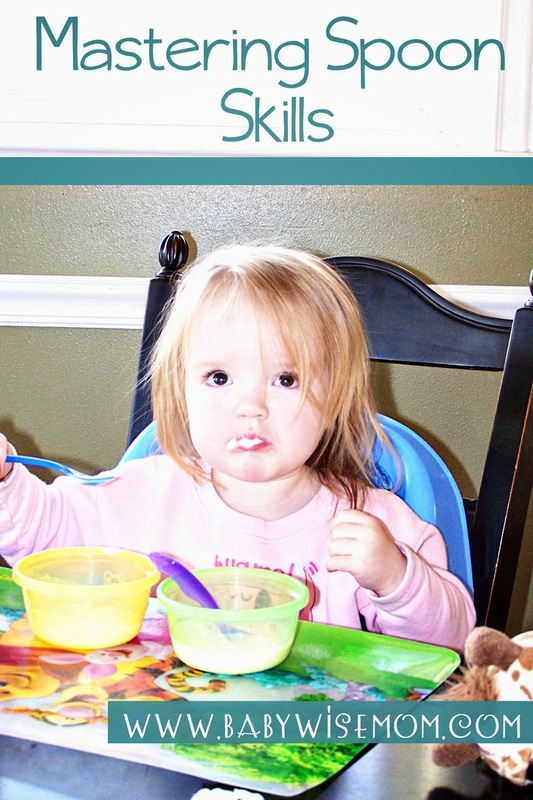 I would recommend this until the child has better coordination and self-control as far as keeping the food where it goes (bowl, spoon, and mouth; not hands, hair, and floor). Foods like applesauce and yogurt can wait for abilities to improve. Your definition of “mastering.” If your idea of mastering the spoon is some food gets from bowl to mouth, then it will happen quite quickly. If your idea of mastering the spoon is food gets from bowl to mouth with no mess in between, it will take longer. The age your child starts practicing. A 12 month old just isn’t going to be as coordinated as a 14 month old. If your child starts practicing at 12 months and takes two months while your neighbor’s child starts practicing at 14 months and takes two weeks, don’t be surprised. Utensils used. There is a large selection available of spoons and forks for your child to use. You might need to experiment to see what works well for your child. Your child’s determination and desire. Some children are perfectionists and want to eat with no mess and do it just like Mommy and Daddy. Others really aren’t concerned about messes. If your child is one who is not concerned with mess, recognize that and realize his version of mastering might not be the same as yours. This can go both ways. If your child is a perfectionist while you are not, you might get confused at his frustration because to you it will appear to be good enough. Your child’s physical ability. Mastering the spoon is just another skill along with crawling and walking. Your child will develop the muscles and brain function to control those muscles at different ages than other children. While you are working on mastering the spoon, you want to monitor the situation. Don’t be hard on your child if a mess happens and he can’t control it. You are going to have to get used to the mess while learning is happening. That doesn’t mean you need to allow food to be flung; you can recognize the difference between your child simply not being capable of being clean and choosing to make a mess. Also, if your child has a food (like yogurt) that requires a spoon, I would require the spoon to be used. I wouldn’t allow fingers to be substituted. This is a decision up to you, but for me, it would be the spoon. If he couldn’t do the spoon himself, then I would do it. You can allow your child to practice working with a spoon somewhere other than the table at first. You can give him one in the tub or somewhere to just get used to holding it and moving it in and out of his mouth. Again, realize that this is a skill to learn just like an other. With time, age, and practice, it will come. I just LOL when I read your comments about choking! That is so me! My sister’s 3 girls would always seem to choke on anything ANYTIME I walked in the room! Just kills me. I hate the thought of it. I am right there with you on that. Thanks for this post. I am not in a hurry for her to feed herself and she does not seem to be in a hurry either. She is doing fine with finger foods. We will start playing with the spoon in other settings. Thanks again!! You are welcome–it was a good question! Did you notice that playing with a spoon in other settings made your kids want to play with their food at meal time if they had a spoon? I wonder the same thing about playing in a crib…does it possibly make your baby want to play in the crib instead of sleep in it because they often do that, or does it just make them enjoy their crib more (even if they are just sleeping in it)? Also, do you suggest letting your baby play with their own spoon when they eat (before they are ready to try themselves), or teaching them to keep their arms down and out of the way when you feed them until they are ready to feed themselves? No, I didn’t find playing with the spoon out of the highchair to be a problem in the highchair. I think kids are smart, and can differentiate the difference between where some things are acceptable and where the are not. I think I would have the child only use a spoon while eating once he is ready to actually start trying to feed himself.